← Fifteen Years On… Where Has The Time Gone? How do you make your tuna fish sandwich? This has to be one of my all-time favorite sandwiches. I say “one of” because I do have a few more and, like our pets or children, I can’t pick only one favorite. I also love a home-made BLT sandwich. I love a plain sliced tomato and mayo sandwich, as well. Others in my top 10 list would be peanut butter and sliced banana, and a nice Italian sandwich including sliced ham, Swiss and/or provolone, lettuce, sliced tomato & onion, pickle, and mayo, preferably on a sub-roll. As well, I love a hot pepper-steak sandwich, on a bulky roll, home-made of course, with thinly sliced left-over roast beef, sauteed red and green peppers and sliced onions. 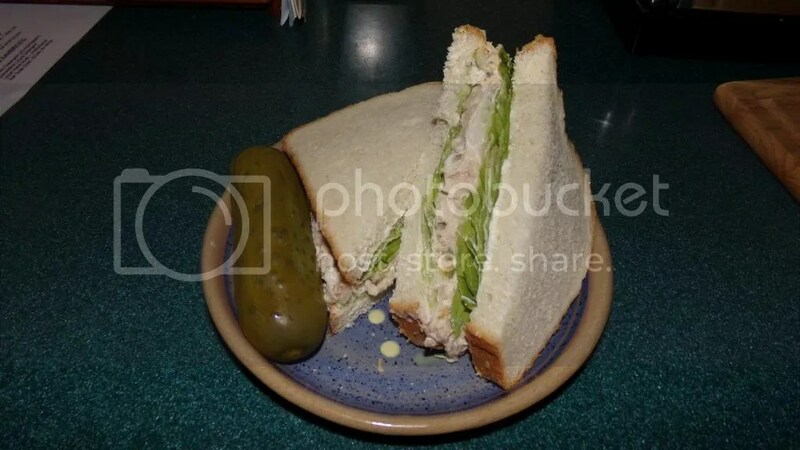 But generally speaking, I’d have to say that my #1 favorite sandwich is the old fashioned tuna fish sandwich made with a spoonful of sweet pickle relish, some mayo and lettuce, and very thinly sliced onion, preferably on white bread. This white bread I have here is called Fiber One Country White Bread and it is not your soft, flimsy white bread, like Wonder Bread or anything. It is a much more substantial bread that happens to be white. 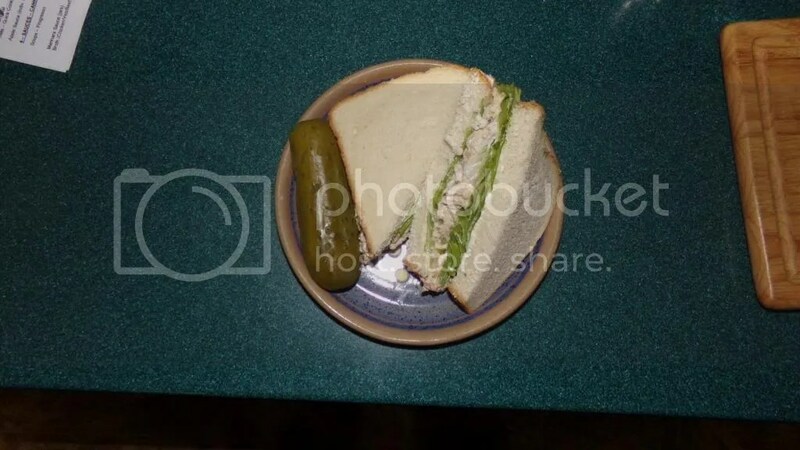 You will notice that it has to have a big dill pickle on the plate, as well. Oh yeah… I love that big pickle almost as much (if not more!) than the sandwich. So, there you have it. My Favorite Sandwich. Do you skip the bread and use healthier pita? Or do you go for the much healthier whole grain breads or darker styles? I’ve had my share of sandwiches with darker breads and they just don’t do it for me. I know a lot of folks don’t love mayo, either, but I love the stuff. Not that imitation salad dressing stuff (I’ve forgotten the name) but the regular mayonnaise. I’ve even tried making my own mayo but that takes too long and makes a big mess to clean up. I also should say that I only use Italian tuna fish in a can now-a-days. In oil, drained of course. The darker Italian tuna fish is so much tastier and retains its shape a lot better than the other brands of white-meat tuna which all seem quite mushy to me. I’ve made my sandwich and now I’m going to eat it. This is my first food of the day – at 11:10 a.m. It’s more a brunch for me as I don’t eat breakfast except for one cup of coffee when I first get up. Don’t be shy… tell me/us about your preferences in sandwiches… ‘kay? 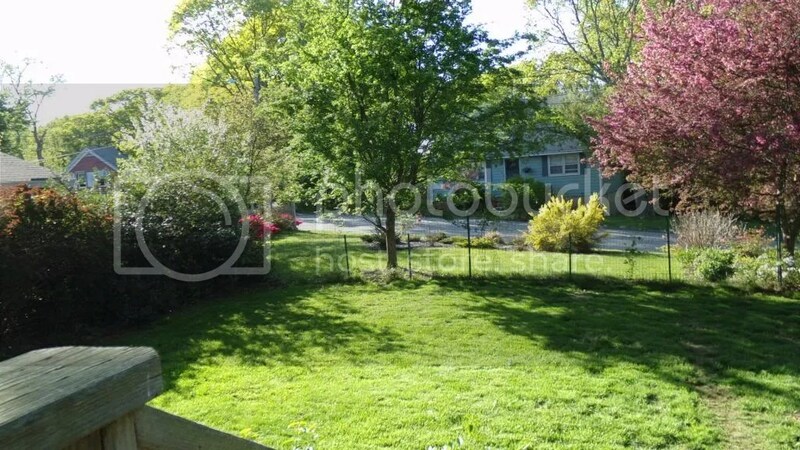 The grass leaves a lot to be desired, but it is where the dogs spend their time outside, so we can’t help the yellow areas. Paul went over them with a rake the other day and roughed them up a bit… I think he should get some grass seed and try to patch things up a bit… but he is reluctant. Just mowing the grass is an accomplishment to him (and to me!). 15 Responses to What’s YOUR Favorite Sandwich? Hey, if I can eat buttered toast with Marmite on it, I can eat anchovies! I went ahead and took Sandy’s advice and made a meatloaf for supper the other night but did not have a cold meatloaf sandwich as I’m saving the rest for another dinner or two for us. Instead I cooked up a small piece of Kielbasa and put it on a toasted hot dog roll with sweet relish and Dijon mustard, and that hit the spot! I like just about all sandwiches, but a favorite is leftover turkey with mayo, cranberry jelly, crisp lettuce, and ground pepper. So, sandwiches are very American. Not really Polish — except for the very devoted Polish sausage crowd. Not a fan. I never quite got in the habit of eating a sandwich for lunch. EXCEPT: along comes peanut butter. Mmmmm, peanut butter. Love love love peanut butter. (Which actually is VERY American.) With homemade jams. For lunch. Every single day. Only the jam varies! I like a plain old tuna salad sandwich with mayo and a little chopped onion, also chicken salad and BLTs. Maybe my all time favorite, but which I wouldn’t make myself, is a hot Reuben sandwich. Bonnie, here’s a page with a great looking recipe for chicken/cranberry salad. Just buy the cranberries dried – like raisins – I’ve seen them in packets/bags near the raisins before. Good luck. I love chicken salad too! Egg salad, chicken salad, ham salad always on non-white unless we find the fresh rolls at the store. Love dark pumpernickle. Like pickles but must use the dills sparingly. Do I mix up my own? Not any more. I just found a delicious chicken cranberry salad at the store. Would love to know how they get the cranberries so I could do my own. I too love cold meatloaf sandwiches from homemade meatloaf. Yum! Bex, when it comes to sandwiches made by someone else my favorite would be the veal parmigiana subs made by the late, great Bea’s in Lawrence MA. Oh, TT, you reminded me… near my top favorite has to be a Reuben sandwich, but not made by me… made by Kelly’s Roast Beef over in Danvers, MA. Wow, that sandwich blows me away. Harriet – yes, I get the aversion to raw eggs… I once got food poisoning from a tuna/mayo sandwich that had stayed out in the sun too long… it was the worst 24 straight hours of being sick I’ve ever spent… now I am paranoid about raw eggs! Cold meatloaf on rye or bagel…will sometimes make a whole meatloaf and use only for cold eating. For me, bread has to have something other than processed wheat flour and no honey to improve the flavor. That said, I can put almost anything on it. My favorite sandwich all depends on what I feel like having that day. I also love tuna fish sandwiches – AND I am also one who only eats tuna that’s in oil. Can’t stand the flavor of the stuff in water. Once in a while I’ll add sweet relish to the tuna fish. I also love BLT sandwiches on white bread, the standard PB&J on white (mixed berry jelly), and straight sharp cheddar or monterey jack cheese sandwiches. But I also like rye bread with caraway, and really enjoy ham and mayo on rye.